Something funny happens to the chickens in winter. They just don’t want to lay eggs as often, as much. Neighbor Dude is lucky to squeeze (no pun intended) a dozen eggs a week from his chickens. I’m thinking maybe they’re just into basketball, maybe hockey, this time of year. Dude just says, “You’ll have this with chickens.” Like the rest of us in a much-too-long Pennsylvania winter, they don’t like the lack of sunlight. To make up for it, most folks who raise chickens will provide artificial light. Chickens aren’t the brightest crayons in the box; they can be easily fooled. Dude gives them extra light, too, but there are still fewer eggs. They wander the barn yard free, but they’re still wasn’t enough to scratch at. So he started supplementing their feed a bit -- judiciously – with table scraps. It worked! By the end of the week, I had enough extra eggs to indulge my urge for mustard pickled eggs. And it was Dude who turned me on to them. My husband is a big fan of pickled eggs but his favorite use pickled beet juice as the brine. Dude had shared with me a recipe he brought back from the Pennsylvania Farm Show and I loved these yellow guys. They’re pickled, all right, but they also have a piquant spiciness, thanks to the mustard and seasonings, that I like. Mix all ingredients, except eggs, and pour over eggs. Let sit, refrigerated for 3 to 4 days to reach full flavor. You can speed up the process by heating the pickling mixture before pouring over the eggs. I did add yellow food coloring this last time I made them. They were a little pale the first time. I got to wondering, though, would a little turmeric yellow them up nicely and add an extra li’l kick, too? Oh does this appeal to my egg-loving heart. Love the spices. Sorry the chickens are sick of winter also! I have to tell you that also here, in Romania, chickens are lazy in laying eggs in winter. :))) I can't wait for spring! Your pickled eggs look very cute. I never eat such eggs. How much time can they be preserved like this? Brindusa -- They'll keep at least two weeks refrigerated but at my house, they won't last that long! Claudia -- I'm an egg lover, too! So glad they're not banished from our "good food" lists. Who can argue with only 70 calories and all that protein! They do make a stunning presentation! It has been years since I have had one. I don't know of any local deli's that have them lined up in jars wooing us. The mustard is a wonderful addition as is the beet. I've never had a pickled egg and don't like beets (sorry Mr. Rosemary's husband), but I could give these mustard pickled ones a try. As for the tumeric, I don't think you would get a real flavor difference, but the color would be lovely. Val -- They are pretty enough for an Easter basket! The beet ones are prettier, I think, but I like the mustard ones. Mary -- I told my husband you called him Mr. Rosemary and he loved it! Maybe that's his new name here! I think you're right about the turmeric -- color, little flavor. More natural, though. I love beet pickled eggs and am certainly going to give these a try. I think I'll use the turmeric. Oh goodness! I want to try this so badly. 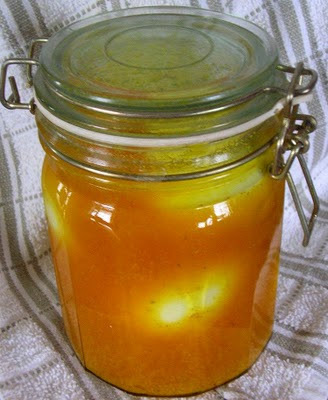 I adore eggs (and mustard), but I've never seen or tried pickled ones before. Thanks for sharing, sweet lady. I hope you have a splendid weekend full of sleep, laughter and love! 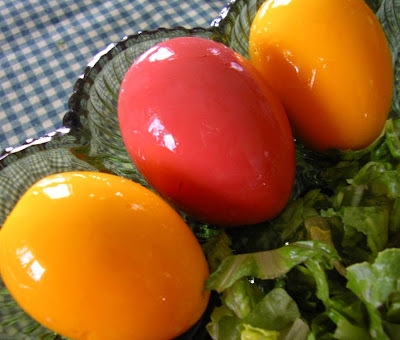 This pickled eggs looks very yummy, I love the colours of these lovely eggs. I am trying to imagine how a pickled egg would taste. Maybe like a deviled egg made with Miracle Whip...only not? They sure are pretty. These pickled eggs are so colorful, very neat, I would love to try! wow This is really very interesting! I would really love to try! Man, I haven't had pickled eggs in the longest time, since I was a kid probably. My aunt always made them but she moved away when I was a teenager and I don;t get to visit her much. Not sure if I would like the mustard version but I would definitely try them! I haven't had pickled eggs in such a long time. I love the preparation of your pickled eggs and the spices especially the mustard. Such pretty colors...Easter is early in your household! I've never understood pickled eggs... til now. I'd only ever seen them sitting in jars of murky vinegar in English chip shops. Your pickled eggs are in a whole different league. How beautiful they are! A jar of these should be mandatory picnic food. I've never eaten a pickled egg. But these look so pretty that if they were on a plate in front of me there would be resisting them. what an interesting recipe,well done,and I'm glad that i discovered your blog,it's really pleasant and has wonderful posts! Oh my - these look fabulous! I like the idea of using a little tumeric in place of the food coloring. These are look so easy to make that it would be a sin not to give them a try. I made these using turmeric, they were delicious!